Here's a personalized favor that your guests won't want to be without. And this one will keep the memories of your special day brewing for years to come. From Fashioncraft's Silkscreened Glassware Collection, each favor measures 3 .75" tall x 4 .5" in diameter, with an 11 ounce capacity, in a classic mug shape with a sturdy handle for an easy grip. Each is made of white ceramic and they're perfectly fitted to be silk screened with amazing accuracy directly on the ceramic in a wide variety of all occasion themes, designs, colors and titles that match your theme and your personal preferences. 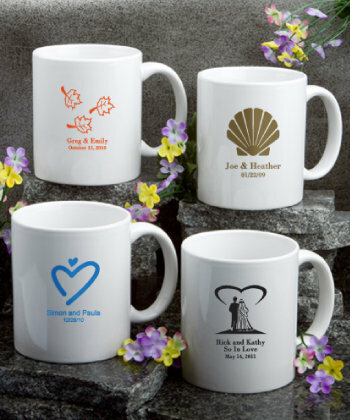 Sure to be a memorable addition to your guests' morning routine or coffee break, these personalized white ceramic coffee mug favors come bulk packed. Please allow two weeks for silk screening and processing as well as transit time for shipping to your location. I like the mugs, the staff were very helpful and patient with me when I had to make changes after ordering. It arrived on time. Will order from them again. Fast service! Good quality, great price. These ceramic coffee mugs are perfect. I ordered 50 for my future daughter in law’s bridal shower! Great price, great quality. They will make awesome favors! I love the quality. I wish you could design around the mug. But in general very pleased. I ordered the sample first to review and check before ordering for the baptism of my baby girl. I purchased these mugs for my cousin's baby shower. I am very pleased with the design on the mug as it matches the theme of the party. The mugs arrived unbroken in a timely manner. I am very pleased with my purchase. The items turned out perfectly! I ordered 100 pcs and the price of product was decent when they arrived they were properly packed and all 100 cups where intact! The cups were good and my design print was great I ordered them with the individual boxes and everyone loved them. Thanks!! I am very satisfy with the ceramic mug order. The arriving time was perfect. I was surprised they arrived so fast. The color, letters font and message was written the way I chose it. There was not mistakes. The boxes very easy to assemble. And the most important of all my party guess love it. Thank you Nice Price. I ordered the coffee mugs for my grandmother's 90th birthday and we all were very happy with the quality. The best part was the customer service. I ordered these mugs with short notice on the standard delivery date and emailed the company to see if they would arrive on time without paying additional shipping charges. To my surprise they arrived early and none were broken! Would definitely order from them again for the service, quality and best of all price. They came out absolutely wonderful.Arrived on time I am very pleased with these items . I ordered mugs for my friend's 40th anniversary party. They came will within the timeframe promised and look great. Also I was able to increase my quantity after my initial order (but before it was processed) with no hassle. Will consider this site again for future needs. The mugs were nice and came in a timely fashion. The customer service representative was available and very helpful with answering questions.